I’m not going to do a big piece on PRIVATE LIFE. Yes it played early in the New York Film Festival, but it almost immediately started on Netflix so if you have the service you can see the film at any point. The film is a sweet little slice of life that doesn’t do as expected. Katherine Hahn and Paul Giamatti are the couple who are throwing everything they have into having a child. They are real and wonderful. You really like them and you feel the pain and frustration at not being able to conceive. They are so good that they overcome the occasional bumps in the script. 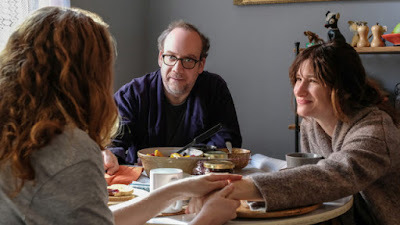 As several people have said the reason that the film works is that Hahn and Giamatti make you feel and understand that there is a deep love underneath it all that is why they are together. I was moved in the film several times in the film sometimes in unexpected places, usually in moments that meant nothing but felt so real it moved me. It’s those moments that are the reason that you should make the effort to see the film. PRIVATE LIFE is currently on Netflix.